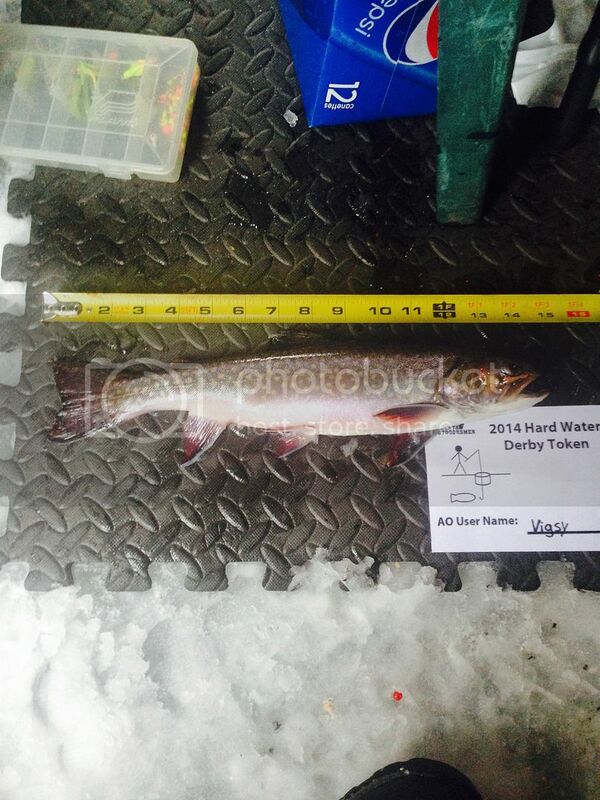 This is the official entry thread for the 2014 Hard Water Fishing Derby. Here you will find rules, instructions for participation, other members entries and the current standings. Anyone on this forum can participate in this derby, no registration is required just submit entries according to rules below. IMPORTANT: Please NO discussion/congratulations in this thread. This thread is meant only for contest submissions. You are definitely encouraged to talk about your fishing trip and your fish, but please start a new thread or use the following thread. There are multiple categories associated with this derby as specified below. The awards for winning a certain category is bragging rights and winners will be supplied with signatures that they may use if they want. 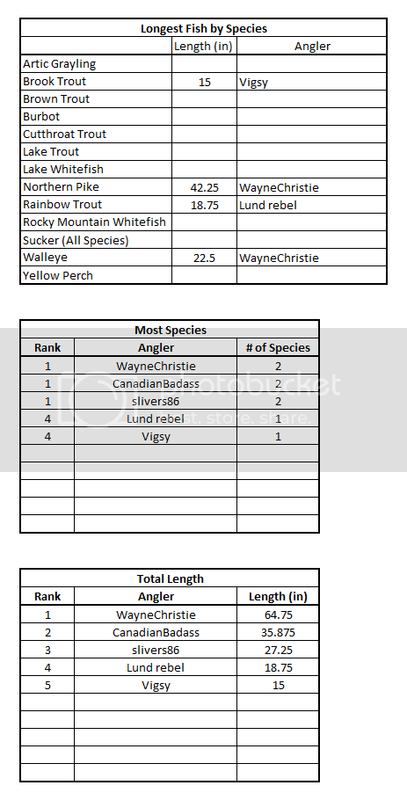 In determination of Best Alberta Slam and Ultimate Alberta Angler only the largest fish of each species will be counted. You may submit multiple entries as you catch larger fish but know that only the largest submitted fish will count towards your totals. 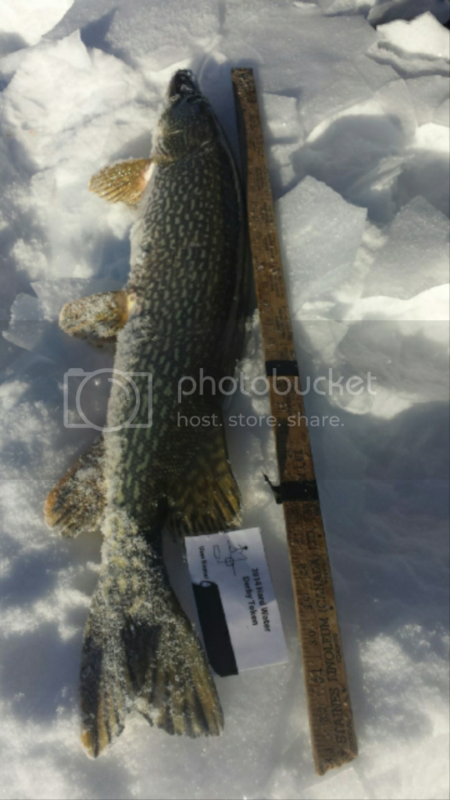 Example: If you post pictures of a 12” perch, a 36” pike, and a 15” rainbow your total would be 63”. If you get a 13” perch your total will become 64”. I will be keeping track of the standings and updating this thread with them every other week(and possibly more often near the end). 1. Print off a token(token will be posted either this Wednesday or Thursday) and fill in your AO username and remember to take this token with you when you go fishing (you’ll need to take a picture with it). Using the token is the only way to guarantee your fish will be counted, that said if you forget it at home etc then your picture will still be accepted if the following conditions are met. 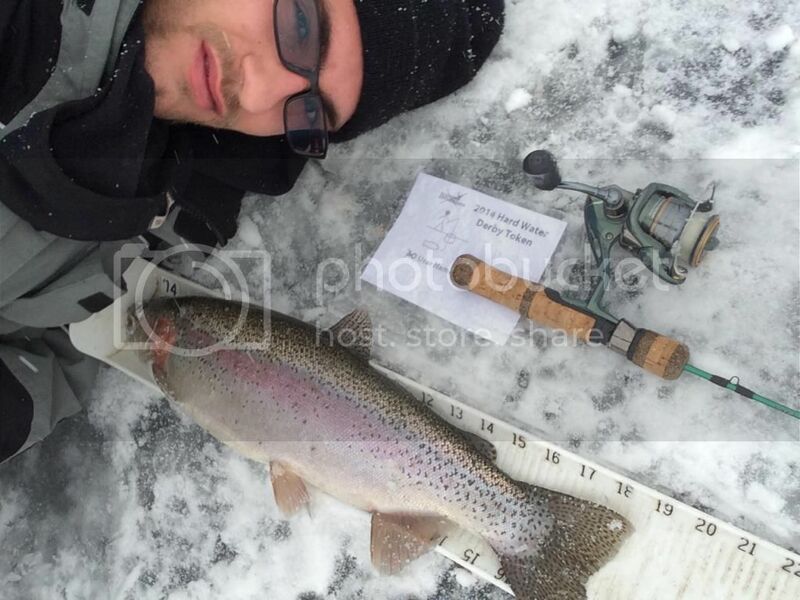 Proof you caught the fish by having your username, face or other distinguishing feature in the photo. 3. In your post, please put the SPECIES NAME, and your MEASURED LENGTH. 4. Photos must be posted within 2 weeks. Stockpiling fish and submitting them at the end of the derby will not be accepted. 1. Official Judges: AO members AppleJax, RavYak and CanadianBadass will be acting as judges. There hopefully won't be any issues but if there are the judges will converse and their decision will be final. 2. Timeline: November 22, 2014(Changed due to early ice) to March 15, 2015. ALL entries MUST be posted by noon on March 16, 2015 to be eligible. 3. 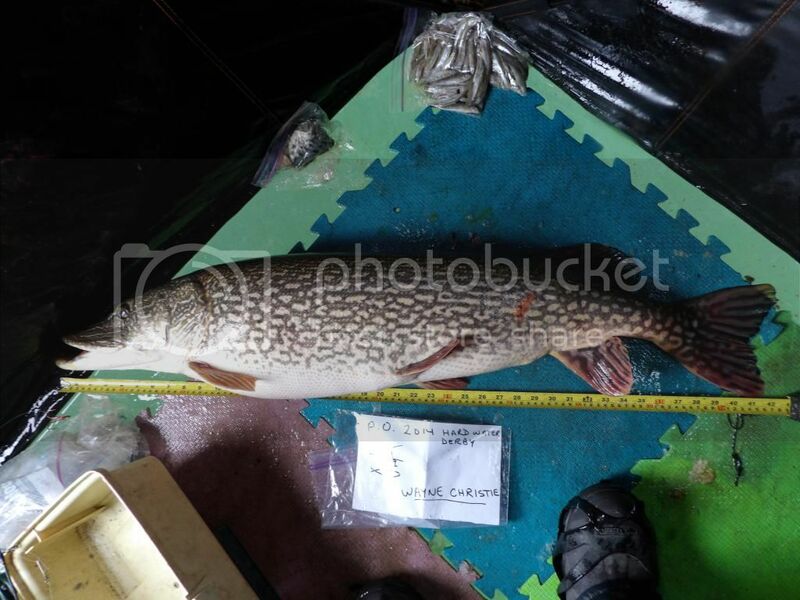 Photos: Must show the entire fish in a live healthy state, your token, and fish measuring device(measuring board, tape measure etc). Please review and follow these photo requirement/suggestions. Photos taken at home afterwards will not qualify. Photos of dead or frozen fish will not be accepted. 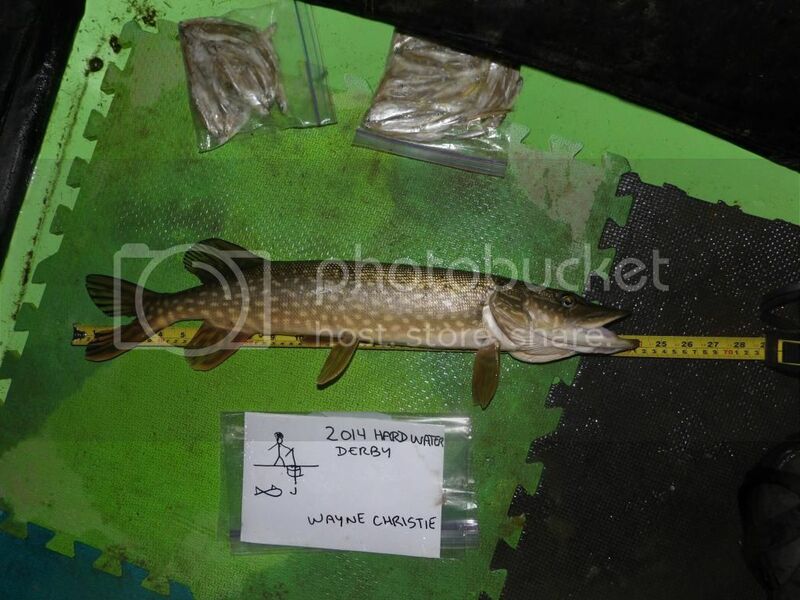 Photos where the measurement isn’t legible can not be counted either. Photos in which only a partial measurement can be clearly read will be scored as the largest readable measurement as determined by judges. 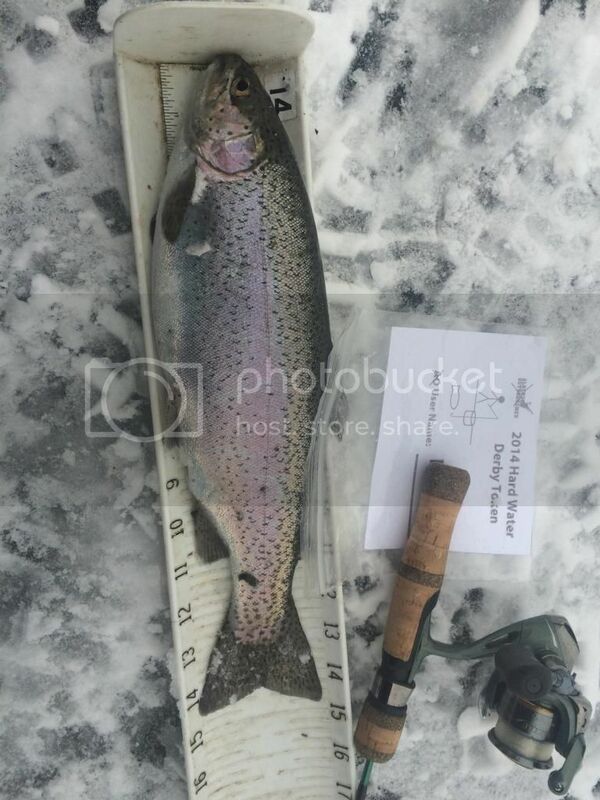 Using a measuring board is recommended as it not only makes attaining the photo much easier but it also provides a boundary for the fish to keep it out of the snow. At this time a boundary is not required but is recommended. Suggestions for a boundary include a garbage bag, tarp, rubber/foam mats, measuring boards and more. Metal surfaces are obviously not good boundaries and cloth will work but should be damp. If you choose not to use a boundary please thoroughly clear the snow from where you plan on doing measurements. 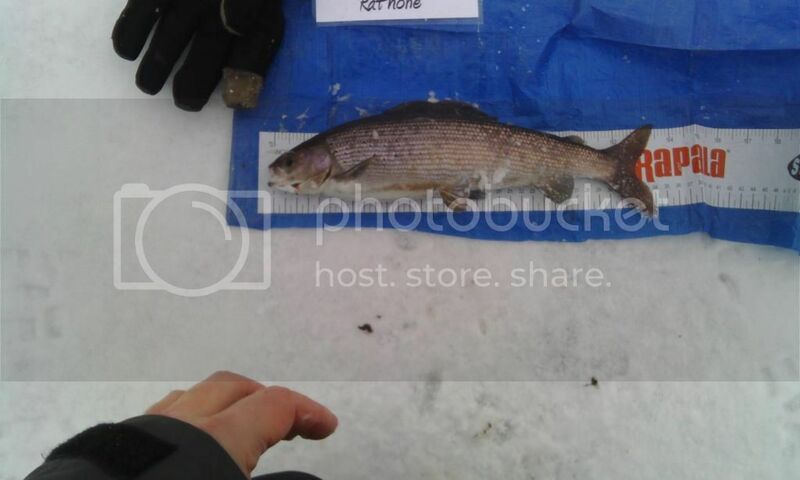 If there are an excessive amount of photos showing snow covered fish I will change the boundary to a requirement. 4. Locations: It is not required to disclose the lake of origin with your entry but the lake must be managed under the Alberta Fishing Regulations (ie: no private or community lakes). If a judge requires further proof the lake is in Alberta, be prepared to verbally verify it in confidence. 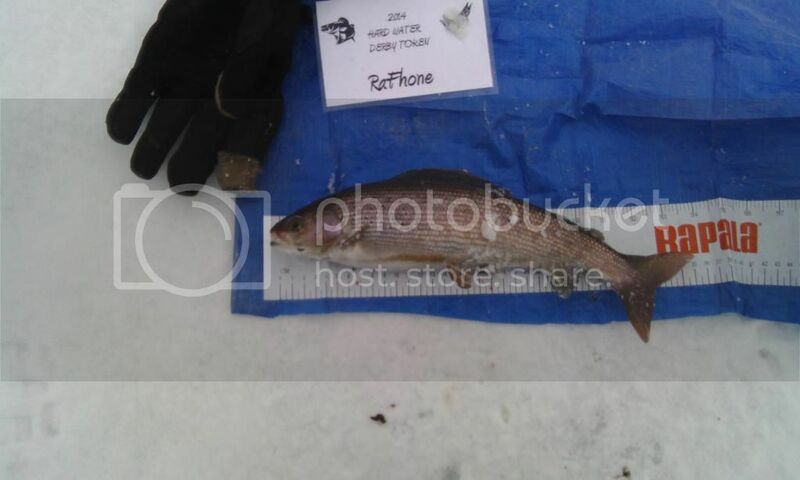 C&R is encouraged, but submissions of fish being kept are acceptable as long as the fish is live and healthy at the time of the photo. If you are practicing C&R, handle the fish with the least possible impact, “C&R Fish Handling Suggestions” are provided below. Please try your utmost to use these for the contest. In accordance with the official SRD stance, participants are encouraged to use barbless hooks but are not legally required to do so. No negative posts about any of the above, use Private Messaging if you feel the burning need, or just lead by example. Length – The total length (maximum) of a fish is measured from the tip of the nose or jaw to the tip of the tail fin, with the tail pinched. 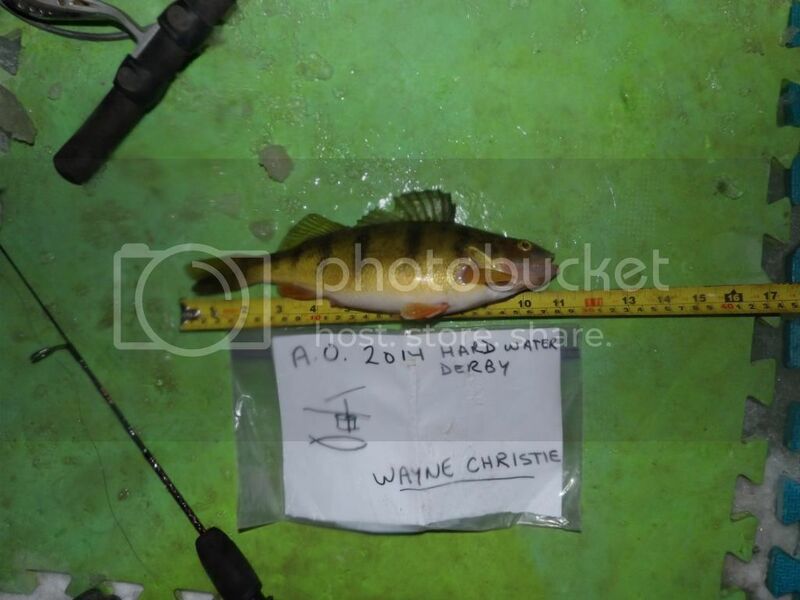 NOTE: When measuring a fish either lay the fish on or directly beside tape so that it can be easily read. 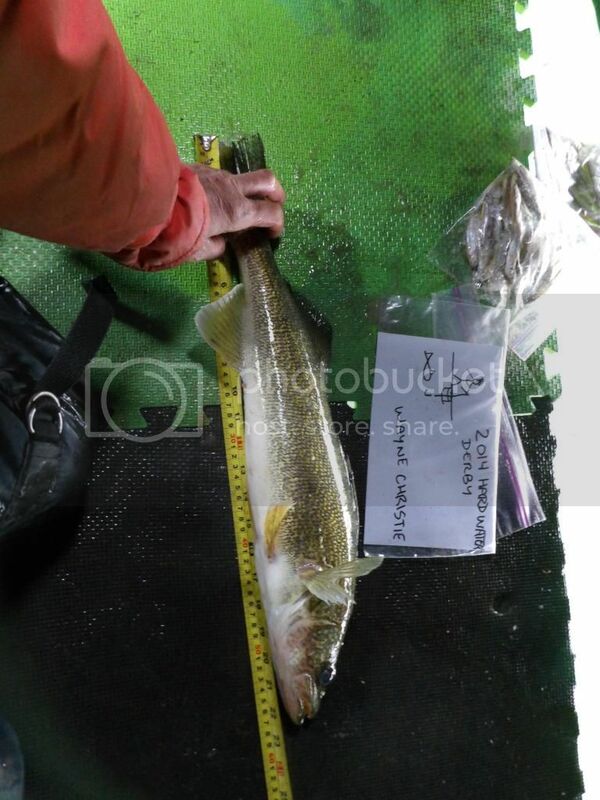 Do not set the tape on top of the fish or far away so that an accurate measurement is not possible. Please avoid using flexible tape measures as they are less accurate and also know that a yellow measuring tape is usually easier to read in a photo then a white one. 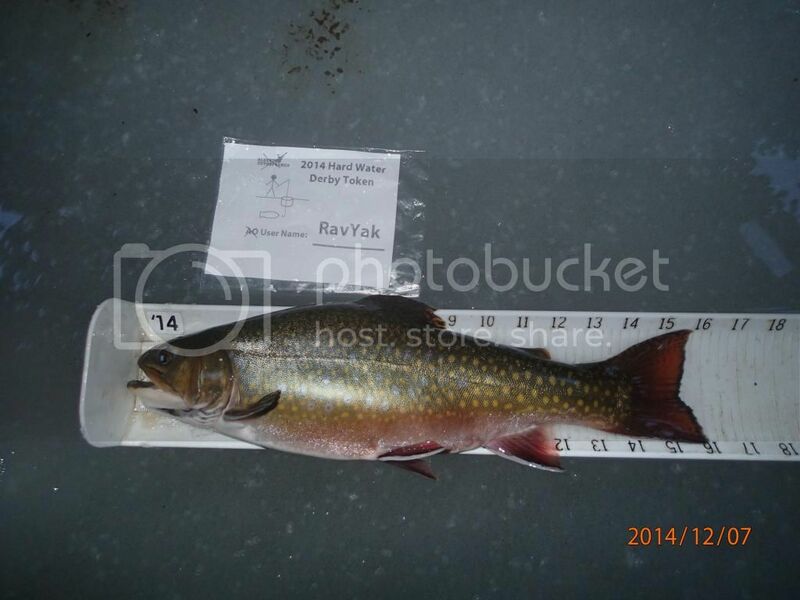 As mentioned above a fish measuring device makes measuring and photos much easier and I highly recommend having one. You can either make one or buy them at most fishing stores. Fish handling is all about doing the least harm possible to the fish, which involves two main ideals: keeping the protective coating and not causing physical harm. 1. Protective coating: All fish have a protective coating on their skin, compromising this coating has long-term negative health consequences. When grabbing the fish, refrain from using rough surfaced ‘fish gloves’, wool or cotton gloves are okay if they are soaked before handling the fish. If using bare hands, getting your hands wet before handling fish will cause less damage to the protective coating. When you are laying the fish down, it helps to wet the surface beforehand. 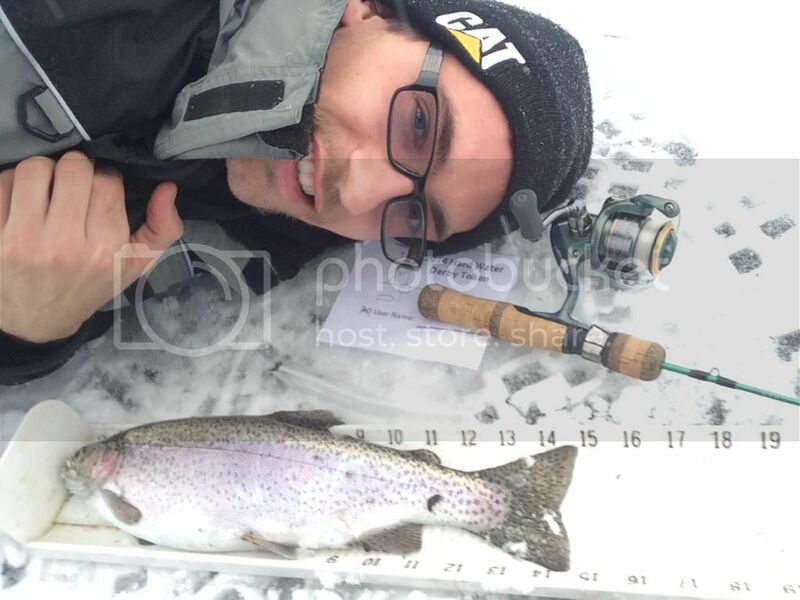 Please do not lay fish directly in snow as it will freeze to them, take the time to clean a spot for measurements when you arrive. Handle fish with a secure grip. A fish dropping onto the ice and thrashing against objects will severely impact its protective layer. Do not put your fingers in the eyes of the fish. Limit the time the fish spends out of the water. If the fish has an over-inflated swim bladder, do not puncture it or squeeze the fish. Put the fish in the water and allow time for the bladder to deflate. Holding fish horizontally is better than vertically, as it causes less stress on vertebrae and organs. Carry needle nose pliers to allow hook to be removed more easily. 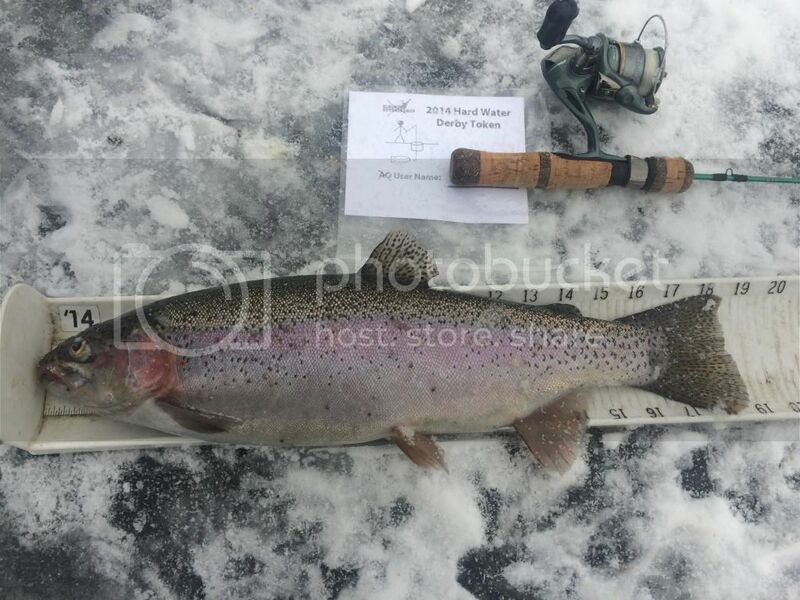 Check tipups frequently to reduce stress time on fish. Very Important: Remember to have fun out there and good luck to everyone who participates. And just to reiterate. Tokens will be made available this coming Wednesday or Thursday and the derby will be starting next Saturday, November 22nd. R.I.P Travis Colby .. You were a great friend, Father, Brother, Mechanic and Son . Will always miss you Budd ! Ok guys, here are the tokens. I set it up so that you can print 4 on one page so you have extras. Thank you sir. I fully intend to improve my score this season. I'd be watching over your shoulder...no where to go but up for me! OK - my goal is to at least catch one. Last edited by Pixel Shooter; 11-23-2014 at 01:15 PM. Here's my entry with no proof other than my word so I guess it won't count but this is what I got for my hard work yesterday out in the foothills. It also wouldn't count because the derby didn't start until today . 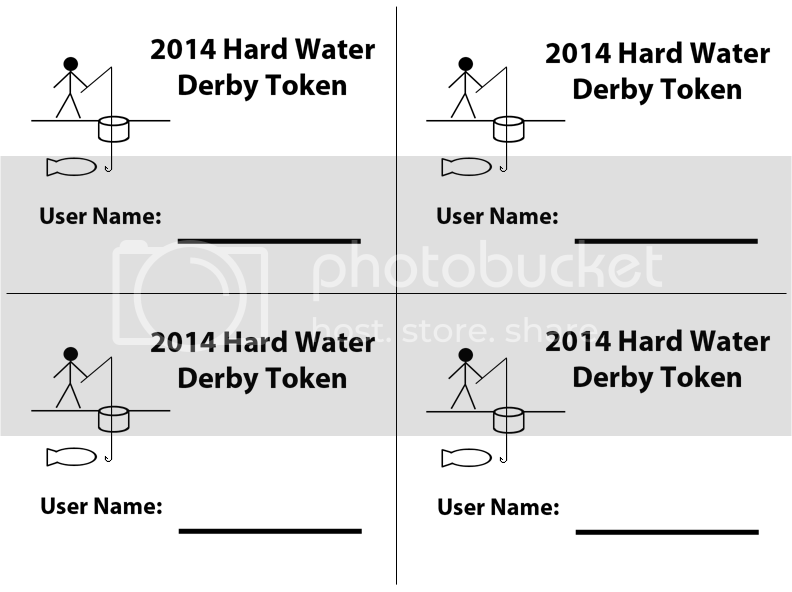 Remember that if you forget your token all you need to do is prove date and identity(or write hard water derby and username on piece of paper, in snow or whatever). A token guarantees your catch will count though and as such is the recommended method. Lund Rebel, print a token :P.
Here are my first additions to the board ! 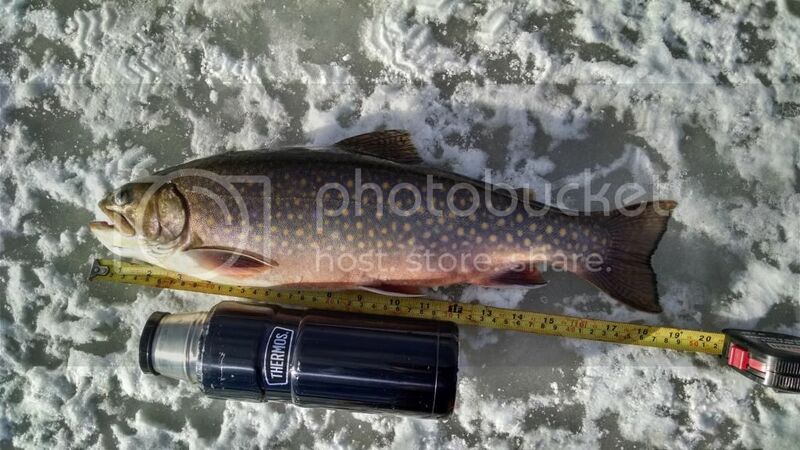 Just something to put me on the board- 15" Brookie, didnt have the new tokens at the time. Keep em coming guys! Please remember to post your measured lengths as it is a lot easier for me to confirm a length then it is to try and determine one. I will be posting the first standings update middle of next week. 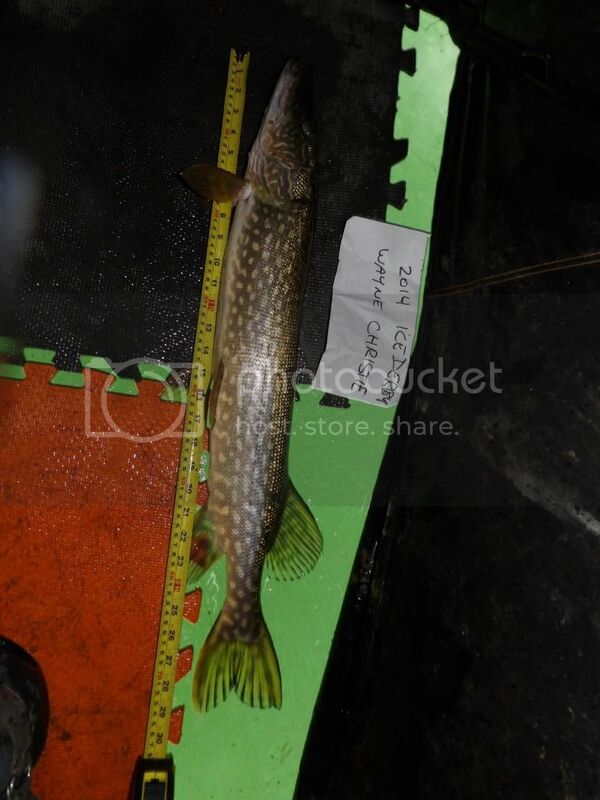 Im a little dissapointed, only managed to bump my pike 10 inches so far. 42 by 21 inch lovely fat girl now. Pics when I get home. and my best of the day, 42 1/2 inches pinched. anyone missing a poodle? First standings update. I need to stick to photographed lengths to be fair so some measurements may be slightly different. sorry for the bad pics, he wouldnt stay still and wanted to get him back home. 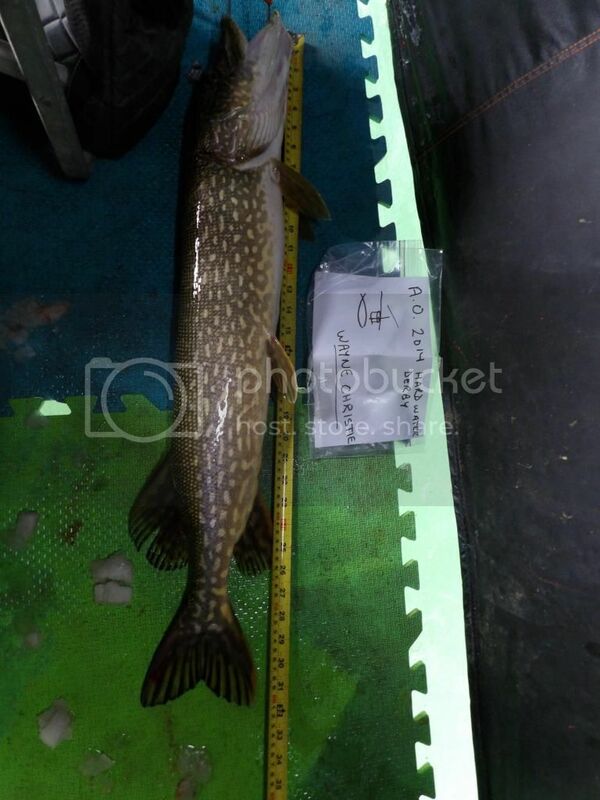 33 inch pike I hope pic works! Finally got out and caught a fish worth entering. Thanks for sending me the better picture to confirm length. Here it is for others interested. Hey now, I believed you just have to be fair. It seems the AO upload is making your images smaller/poorer quality for some reason. Using photobucket is a little more work but much better quality imo. Here is a thread on how to post pictures with photobucket.